Glee returns and Jane Lynch engaged! Glee is making headlines for not one, but two reasons this week. From Jane Lynch’s engagement news to Glee’s musical return April 13 — this is a terrific week to be a Gleek. First in Glee gossip, star Jane Lynch confirmed on April 11 that she is engaged to longtime girlfriend, psychologist Lara Embry. Glee fans are also excited to finally welcome back one of network TV’s most original shows. Glee’s return is a long time coming, since their last episode aired December 9. If you’re new to the Glee fan club, here are the details on the Fox smash. Glee follows an optimistic teacher who yearns to save the McKinley High School Glee Club from being obliterated. The Golden Globe-winning show airs at 9:28 pm, with Broadway celebs Idina Menzel and Jonathan Groff as guest stars. In this enthralling new episode, expect Groff to spice things up with Rachel, which, of course, will complicate her relationship with Finn. Menzel will play the coach for rival club, Vocal Adrenaline, of which Groff is a member. As for more? inside scoops, the newly single and ready-?to-mingle Will?,? questions his feelings for Emma. ?And,? 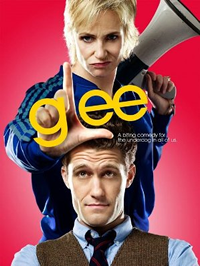 as usual, Jane’s character, Sue Sylvester, toys with getting rid of the glee club altogether.? ?Would we expect anything less from Sue? ? Gleeks everywhere will not be disappointed as there will be a rendition of the Beatles’ hit, ?? ?Hello?, Goodbye.? Next we?ek the show returns to it?s normal ?9 p?m?? time slot.